Lesbian and gay Christians have criticised secularist plans to protest at the Pope's visit to the UK this month. The Lesbian and Gay Christian Movement (LGCM), said that the tactics of some campaigners were "unhelpful and counterproductive". The Protest the Pope coalition has been leading complaints against the Pontiff's visit, accusing him of being against gay rights and women's equality. Members plan to stage protests during the four-day trip. But the LGCM said: "The Protest the Pope coalition of secularist groups has opposed the trip and promised noisy protests, but progressive Christians believe that this is unhelpful and counterproductive." Instead, the Christian body has said it will hold a prayer vigil instead of a protest to show the Pope that his "homophobic comments affect real people". In a statement last week, the LGCM said that while it disagreed with the Pontiff's teachings on sexual orientation, his UK visit will be an "occasion for celebration". Members of the Protest the Pope Coalition responded angrily to the Christian group's criticism, with Peter Tatchell accusing it of "sitting on the sidelines". Mr Tatchell told PinkNews.co.uk: "This is very disappointing. LGCM should be publicly supporting the many Catholics who dissent from the Pope's harsh, intolerant teachings. "How can LGCM not applaud protests that highlight the Pope's approach to women's rights, gay equality and the use of condoms to prevent the spread of HIV? "It is a mistake for LGCM to sit on the sidelines and not participate in Protest the Pope's lawful, peaceful protest against the Papal visit." Keith Porteous-Wood, of the National Secular Society, added: "Prayer vigils are not going to tell the Pope how horrified the lesbian and gay community are at the Pope's increasingly homophobic stance. "I support [LGCM's] work but I think prayer vigils are ineffective." The Pope is to arrive in the UK on September 16th. 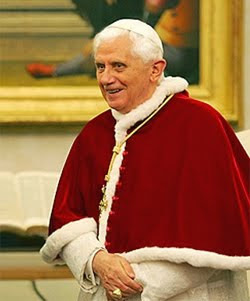 His four-day visit will include a huge open-air mass in Birmingham, where he will canonise Cardinal Henry John Newman.